Just Try It For Today: A Revision Prompt Challenge | Create. Communicate. Connect. 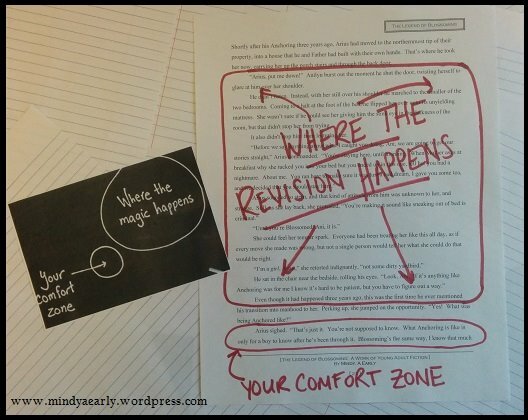 How can we push ourselves to make the BIG revisions? Nine times out of ten, I can personally attest to that. Yet it’s still so hard to do. It’s painful to revise, period. By its very nature, the process demands that you question literally everything you did in your first draft. Not only that, but revision also demands that you have all the answers regarding word choice, plot, structure, tone, and everything in between. Your attempts at solutions manifest through the tedious process of cutting, rewriting, or restructuring on a small and large scale. All the while you wonder, how will you know if the changes will be successful? How will you know if you’re doing the right thing? When I work with writers of all genres and skill levels (including myself), my answer to this existential writer’s crisis is the Just Try It for Today revision challenge. These prompts challenge the writer to make a drastic change – one that might not even make sense at first! I’ve provided three versions of this exercise, each specifically tailored to particular genres. Don’t worry about it, don’t question it, just try one for today – you’ll be glad you did! Choose Your Own Adventure. Create a prompt of your own (or have a writer friend create one for you). Remember, it should be a prompt which requires drastic changes! Considering a play or work of fiction can be upwards of one hundred pages or more, embracing large changes can be hard when we can’t know for sure how it will affect the whole. The Just Try It For Today revision prompts help us cultivate a playful spirit, while providing a vehicle for us to learn valuable things about our work that we may not have discovered otherwise. This genre can be the most challenging to revise, because the events are often true and have a deep link to the author. A Just Try It For Today revision prompt can help a creative non-fiction writer feel more elastic and playful when it comes to how they narrate their story. Good luck revising! Remember, whenever I post an activity, prompt, or guiding writing exercise in the Support For Writers section of my site, I will always write a blog post about the activity as well. That way, if you follow my blog you’ll always know when new exercises become available. Add to the Just Try it For Today prompt bank by offering a prompt of your own in the comments! Speaking of writing, TODAY is the official launch date of Empowered Women of Social Media! You can visit here to read a recent blog post about my mission as an artist and how that connects to my awesome chapter in this book. As you may have seen on my Facebook and Twitter, I was thrilled that my chapter received a beautiful review just hours after the launch. I encourage you to purchase the book on Kindle TODAY, the only day you can buy it for just .99 cents. Purchase your copy here!